The Dark Ranger: The Joy of Optimism? I have never been one known for my positivity. Glass half full? Probably not. That said, after an impressive win over Ottawa in Ottawa and throwing a touchdown on the board against Philly, I began to see, and even feel a glimmer of hope. My hope would be dashed just days later by the feathered ones of Anaheim. Regardless of their change in ownership, they still remind me of everything I dislike about theme parks and tourist attractions. That loss stung on so many levels. Which brings us to last night's game in San Jose. I would stay up late and make an effort to be positive. The start of last night's game did not lend itself to positivity. Between the zebras missing I want to say, 3 high sticking calls to yet another goal deflected off a Ranger's jersey. C'mon. Poor Mark Staal, man. This guy takes a high stick to the chops and then has a puck bounce off him and into the Rangers' net. I was already picking out which piece of furniture would feel the wrath of my frustration, but still refused to give up. You can't give up on this team. You can't, because you know they don't have quit in them. They work so hard and play with their hearts. They battle. I am talking Mel Gibson in Braveheart, they BATTLE!! Just look at Brandon Prust. 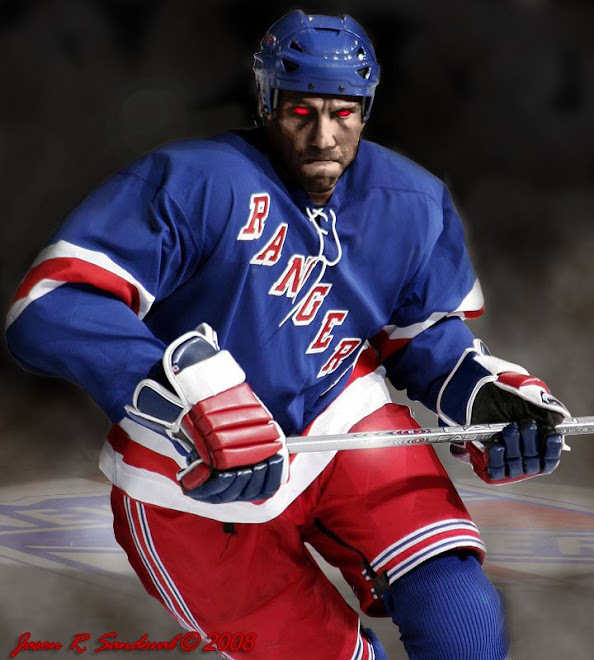 If things don't work out with the Rangers, a stab at being one of the X-Men would not be out of the question. He could easily take Wolverine's place. Seriously, his toughness knows no bounds. That kind of work ethic and tenacity deserves a reward. And yes, a goal from Erik Christensen will do nicely, thank you. Pretty goal. I mean Cindy Crawford circa 1990, pretty. Great pass from Prospal. Well done, boys. for the defense. It was nice to see Michael Sauer put one in the net too. That guy is a worker. He blocked 4 shots last night. 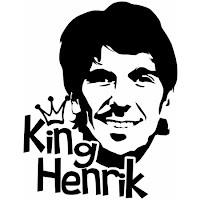 I have never seen him back down to anyone if the gloves need to come off, and offensively he showed some poise in front of the net with that goal he had. Lunch pail? Check. Hard hat? Check. Yeah, punch the time card and go to work, and they did just that. It wasn't just Sauer. The boys on defense did their job last night. What? Did you really think I would forget the King? John Wayne with pads and a glove in that shootout. He is a patient, patient goaltender. He has the patience of a Kindergarten teacher before Ritalin. He didn't flinch. And yes, he is a worker. How can you not be happy for the guy? Great goaltending. Great win. 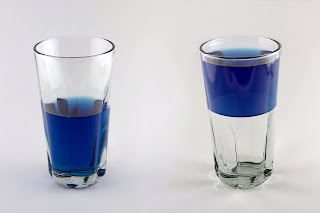 So, did I wake up this morning, brimming with optimism and a declaration that the glass is truly half full and NOT half empty? No. I am not Tony Robbins and I have made my peace with that. But I like this Rangers team and last night I was reminded of why. Wednesday night was a tough loss, and to bounce back the way they did last night was impressive. Resilient. No doubt. Half full? Half empty? Undecided. And really, who cares about me and my negativity? 12 games left to play. All for the glory of the cup. One game at a time, boys. Keep up the good work. Well put. Work ethic is to be admired. It's the stuff that gets sh#t done. Well done Fran-notes. you made me feel like I was sitting with you watching the game. These boys do have integrity and they play hard game to game (with the exception of that Ducks game).